Wait – I gained *HOW MUCH* this week?!?! That’s it. I’ve declared a weight loss goal. I’ve declared it to myself, to my children, to my husband – even to my Weight Watchers lady. By October – I’m gonna lose at least 25 pounds. I’m sick of this belly. I’m sick of the way my clothes feel and the way I feel in them. It’s time to change – and I am in control of what I put in my mouth. I put food in. I choose what I eat. These have been my choices – and therefore I can change everything from now on as well. If I say it loud enough and often enough, maybe I’ll believe it too. So – the second step in this journey is changing what I eat. I’m gonna focus on eating healthier and more appropriate portion sizes. 1/2 cup Whole Wheat Pastry Flour or White Whole Wheat Flour **I happened to have some white whole wheat flour in the pantry. 1 teaspoon Grated Orange Zest **I found this totally pointless and not worth the effort. 8 thinly sliced Chicken Breast Cutlets (about 1 1/4 lbs). 1/2 teaspoon Salt **I skipped this as Kosher Chicken is already salty enough. 1 10 ounce package Mushrooms, sliced **I used an 8oz. package of regular mushrooms and sliced them myself. 1 Shallot or 1/4 small Red Onion, finely chopped **I used a big shallot. 2 Tablespoons reduced-fat Cream Cheese, at room temp **I used Tofutti non-dairy cream cheese. 1/4 cup packed Flat Parsley, chopped **This was WAAAAY too much parsley. I’d go for, like 2 Tablespoons next time. 1- In a shallow dish place the flour, zest, and pepper. Mix with your fingers until combined. Sprinkle the chicken with salt (I skipped this) and dredge in the flour mixture. 2- Coat a large skillet with cooking spray **WHAT THE F FOR?!?!. 3- Heat the skillet over medium-high heat and add half the oil. 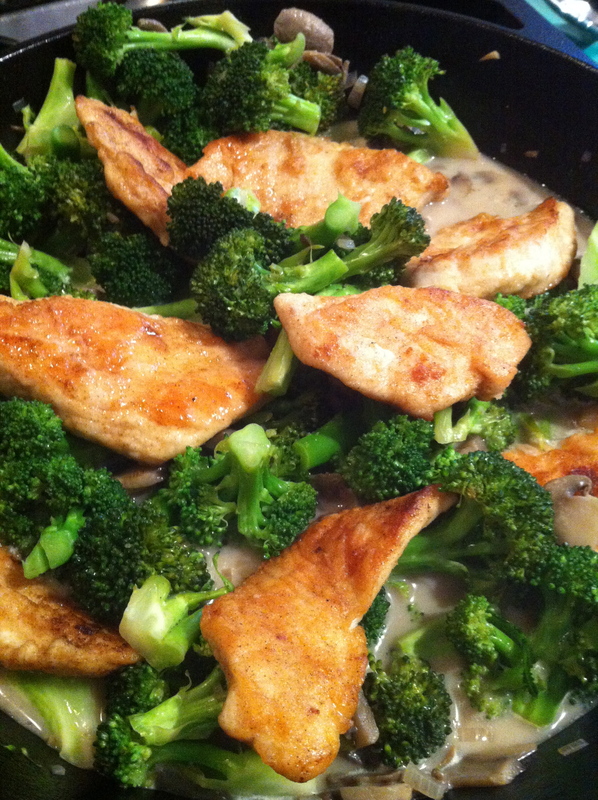 Shake any excess flour off the chicken and add half of the cutlets to the skillet. Reduce the heat to medium and cook 2 to 3 minutes, until the chicken has a brown crispy coating. Turn once and cook 2 to 3 minutes longer, until the chicken is cooked through and no longer pink. Transfer the chicken to a plate. Repeat with the remaining oil and chicken. 4- Add the mushrooms and shallots/onions to the skillet. Cook 4 to 5 minutes, until the mushrooms soften and begin to brown; add 1 to 2 tablespoons of water if the mushrooms or onions begin to stick. Add the Marsala and bring to a boil, allowing the liquid to decrease by a third. 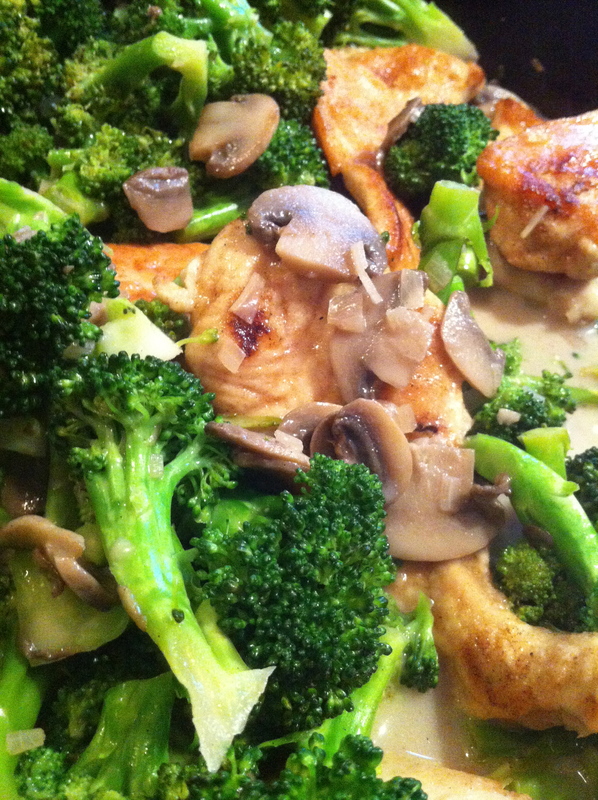 Add the chicken broth and broccoli, then reduce to a simmer and cover. Cook another 4 minutes, until the broccoli is tender **It took me closer to 7. 5- Turn off the heat and slowly add the cream cheese to the skillet, stirring continuously until the cheese starts to combine with the sauce and incorporates the veggies (the stirring keeps the cheese from curdling). 6- Return all the chicken to the skillet. Sprinkle with the parsley and serve immediately. Pretty good…not sure if I’d make it again though. End Result: C thought it was pretty ok for ‘diet’ Marsala, but it didn’t taste anything like real Marsala; The twins only grudgingly ate the chicken. And I? I thought it…okay, but I’m not sure if it was worth it. 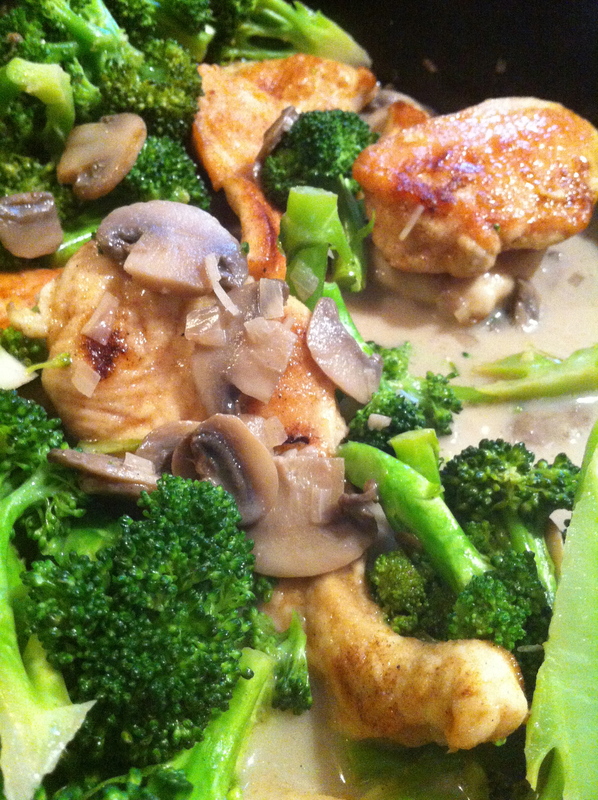 I think the chicken, mushrooms and broccoli woulda been better in a simple white wine/fresh garlic sauce. Oh – and I figured out the Weight Watchers points. This was 6 Points Plus per serving.